Our IRS Debt Settlement Phoenix - Tax Debt Advisors Inc.
Let Tax Debt Advisors Inc negotiate your IRS Debt Settlement Phoenix. 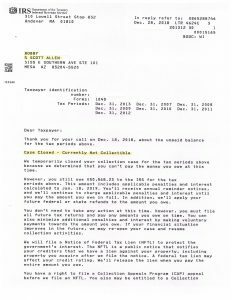 Often times clients will meet with Scott Allen EA when they already have a settlement with the IRS in place. They come in looking for other options. When you meet with Scott Allen EA he will take a look at your current agreement and see if there is another solution better suited for you. Some of those other options could be: a payment plan, non-collectible status, Chapter 7 or 13 bankruptcy, audit reconsideration, or offer in compromise. 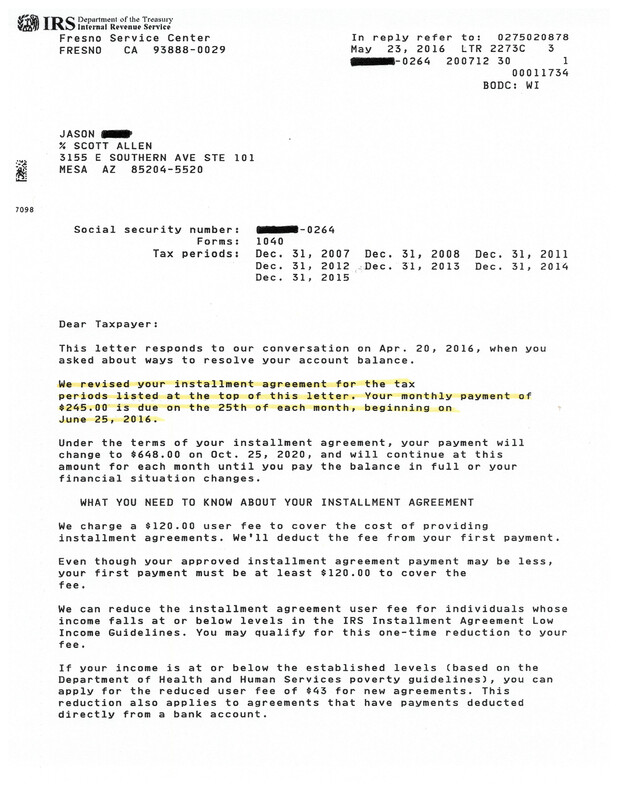 For their client Jason he was in a payment plan over $800 per month. After a complete evaluation we renegotiated the payment plan for only $245 per month. Jason was thrilled with the results. Spend 30 minutes and see what Scott Allen EA can do for you. He will help you get the best possible IRS settlement allowable by law. 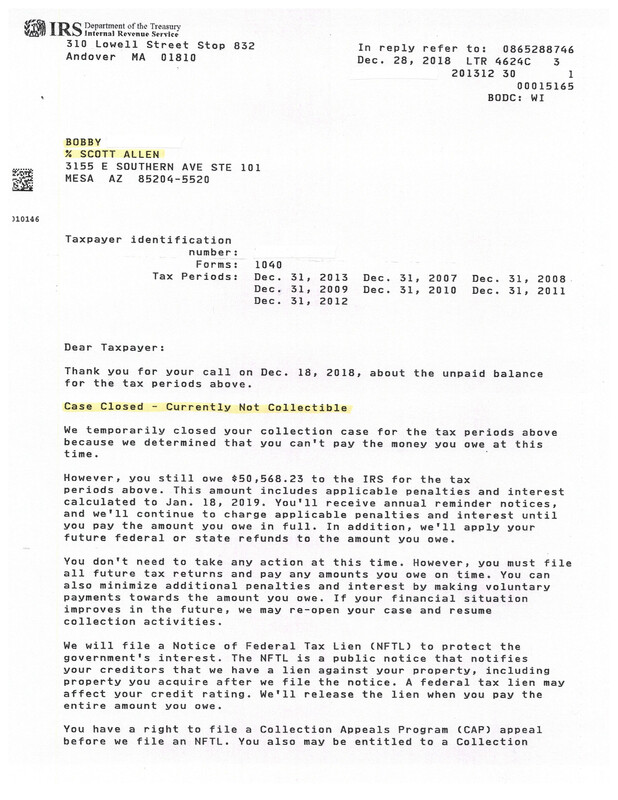 Bobby also needed an IRS Debt Settlement Phoenix. He asked and he received! He was drowning in back IRS tax debt and was able to hire Scott Allen EA to negotiate all into one Currently Non Collectible status. What a relief this was for Bobby. Now he can just focus on his current taxes and taking care of and raising his son. 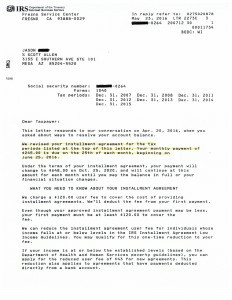 Check out the actual approved settlement letter below from the IRS. Don’t let the IRS get you down any longer. Start sleeping better at night by taking care of your back tax debt and unfiled tax returns. If you are in the Phoenix Arizona area reach out to Scott Allen EA of Tax Debt Advisors, Inc.
Phoenix AZ IRS tax attorney or not? Does the IRS Offer One Time Forgiveness?